Dickey's Barbecue Pit is a true American success story. In 1941, Travis Dickey, a World War I veteran, opened the first Dickey's Barbecue Pit in Dallas, Texas. Dickey was a true Texas character blessed with the gift of gab and the love of authentic, slow-smoked barbecue. In the beginning, Dickey’s Barbecue Pit was truly a family operation with Travis working the block and Miss Ollie Dickey serving sandwiches. Space on the restaurant sign was rented out to help pay the start-up costs for the restaurant and the menu was limited to beef brisket, pit hams, barbecue beans, potato chips, beer, bottled milk and sodas. Brothers Roland and T.D. Dickey took over the business in 1967, continuing their father’s legacy of quality, hickory smoked signature meats. Under the direction of the Dickey brothers, Dickey’s Barbecue Pit expanded throughout the Dallas Fort Worth area and quickly became known throughout Texas for mouthwatering hickory-smoked barbecue, popular catered events and the iconic Big Yellow Cups. Franchising began in 1994 after loyal guests and barbecue fanatics demanded more locations. Today with over 530 locations in 43 states, loyal guests are what keep Dickey’s thriving in every community. The brand has come a long way from Travis Dickey’s first location. But, some things never change. Dickey’s Barbecue Pit still slow smokes all meats on-site just the same way they did in 1941. The menu features beef brisket, pulled pork, St. Louis style ribs, polish sausage, spicy cheddar sausage, smoked turkey, and marinated chicken, with an extensive array of homestyle sides from jalapeño beans to macaroni and cheese. Buttery rolls are served with every meal along with complimentary ice cream. And just like always, kids eat free on Sunday. Make it a plate and add your choice of two homestyle sides to your meat or sandwich for a special price! What could be better than taking one of our fresh salads or smoked bakers and topping them off with slow-smoked barbecue? bacon, shredded cheddar, sour cream, margarine & green onions. Top it off with any meat! Take home a family pack today! The perfect option for picnics, tailgate parties and get-togethers. If you need even more, take look at all of our catering options. All of our Kid's Meals are served with a Kid's drink and side. Don't forget -- Kids Eat Free on Sundays at Dickey's! Go to your local store for more details. Search for deals and coupons from Dickeys Barbecue Pit and over 100,000 other retail stores, gas stations & restaurants inside The Coupons App. Explore exclusive shopping and restaurant offers at thousands of nationwide and local chains. Browse our best coupons, free samples, view local deals or see popular retail stores. 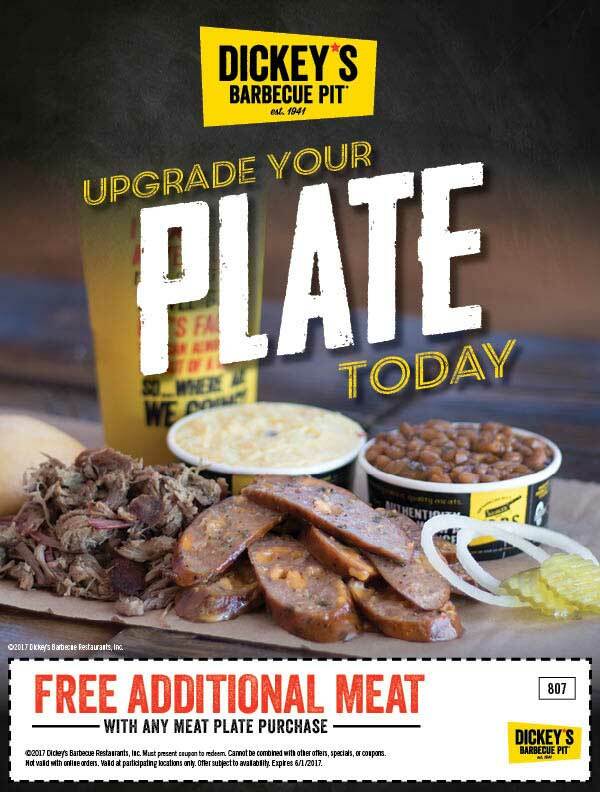 Get alerts when we offer hot new savings at Dickeys Barbecue Pit and all your favorite restaurants & stores. Get automatic notifications when Dickeys Barbecue Pit deals are nearby. Save coupons for viewing anytime, anywhere. Get calendar reminders when your saved Dickeys Barbecue Pit coupons are about to expire. Win fantastic giveaways from our weekly contests!